So, here we are. Perhaps, logically, the Notre Dame game was the more important contest: #1 vs #2, a conference match-up, a road game. This is #2 vs #3, non-conference in the middle of conference play, and a home affair. But, it’s UConn (18-1, 7-0 AAC). Ya damn right we’re getting up for this one. Up until January 3rd, UConn had not lost a regular season game since 2014. And yet Baylor found a way. Could Louisville copy this method? Not likely, as even Jeff Walz admits. Two key factors led to the Huskies’ downfall in Waco, and only one can possibly be repeated tonight at the KFC Yum! Center. Firstly, Baylor has size. Overwhelming size. As in outscoring UConn 52-10 in the paint size. Secondly, the Huskies had their worst shooting night in over 20 years. Sure, Louisville has held its last five opponents to under 50 points. But they were relatively weak opponents, and they weren’t UConn. So unless Jeff Walz finds Treebeard’s Ent-draught sometime today, the Cardinals will either have to outgun the Huskies or hope for an off night. 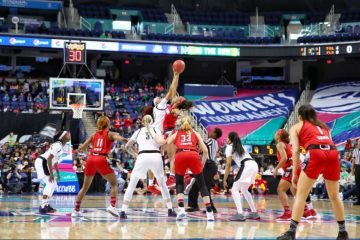 Jeff Walz would say of UConn, “Whoever gets the rebound can go.” Where other teams rely on the traditional inside defensive rebound to outlet pass to fast break, UConn just grabs the ball and runs regardless of the rebounding player. Senior forward Napheesa Collier is averaging a double-double with 18.6 PPG and 10.0 rebounds per game. Add to this the fact that starting senior guard Katie Samuelson has 7.2 rebounds per game, which is exactly one more than the 6.2 average of both Kylee Shook and Sam Fuehring. If allowed, UConn will gobble up every missed shot and convert it to points. The silver lining? Kylee Shook has shown significantly increased aggression on the boards over the past four games. If that can be combined with the stalwart play of Fuehring and Jones, Louisville might stand a chance on the glass. All five UConn starters average greater than 10 points per game, and all five spend over 30 minutes per game on the court. The Huskies are not deep, but they do not need to be deep. 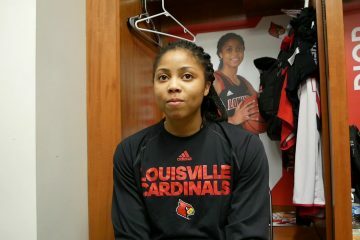 On the Louisville side Asia Durr is averaging 21.1 PPG with only Sam Fuehring joining her above the 10 PPG line. 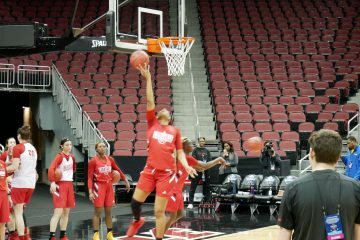 But Dana Evans and Arica Carter aren’t far off, and they could easily be the deciding factors. 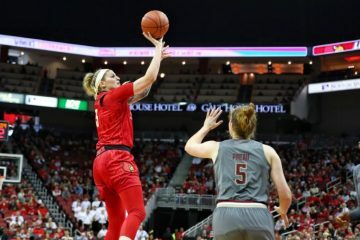 Carter has shown a propensity for three-point shooting streaks, while Evans has proven to be more than capable of combo play at both the one and two. It’s going to be a war on the glass down low, and artillery from deep behind the lines may be what tips the scales. 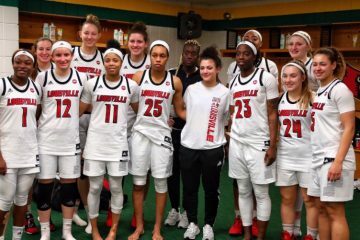 If we see a night like Dana had against NKU, combined with a night like Arica had against Duke, and the winds are blowing just the right way, we could be in for a glorious night in downtown Louisville. Louisville hasn’t beaten UConn since 1993. The likelihood of extending the regular season series is low, as next year the ACC moves to an 18-game league schedule. Statistically, the teams aren’t that different, at least on paper. A solid win against a top-five opponent would help cement Louisville’s positioning for March. But we all know what the deal is. This is UConn, and they are not unbeatable. The KFC Yum! Center needs to be the loudest it’s ever been tonight. That’s your job. The ladies will do theirs.